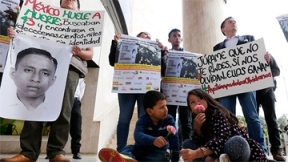 As the investigation of 43 missing students from the Raul Isidro Burgos Rural Teachers’ College of Ayotzinapa continues, it is obvious that they were murdered by the Guerreros Unida (United Warriors) crime syndicate in Iguala, Guerrero state, in collusion with the mayor and police chief of that city. It is only too clear that these 43 students were victims of the continuing drug war. What many Americans do not understand is that the drug war, which sort of began in 2006 with then Mexican President Felipe Calderon’s declaration of war against the Mexican cartels, has been going on even before that. This war has taken the lives of tens of thousands of innocent Mexicans every year. By a conservative estimate, the number of dead in the drug war is around 60,000—more than the number of U.S. war dead from the Vietnam War (1963-1973). The higher estimates go put the number was high as 120,000. But the numbers belie an important problem—namely that the Mexican government has not affected the power and networks of the Mexican drug cartels. Hence, the Mexican Drug War (as it is officially called) is one of the most lethal fights in the Americas today, and is a war on our border. Over the years, I have talked to many people who came from Mexico. Four things seem to be consistent with why they are in the United States. These reasons are no jobs, extreme poverty, some political repression, and high crime rates. Now the drug war, which has become endemic in so many parts of Mexico, has too many people scared and why so many Mexicans either have fled Mexico or do not wish to return. I cannot blame them on this one. This war is also having a dramatic impact on the United States and Americans—the illicit drugs brought into the United States every year by the drug cartels has resulted in billions of dollars being spent in trying to help Americans destroyed by these drugs as well as the crimes committed by Americans to feed their drug habits. The billions of dollars earned from the drug trade has helped these cartels acquire all the weapons they need and pay for hiring people to commit some of the most savage crimes on this continent. What the U.S. government does not seem to grasp is that this war is right on our border. Unlike the fight against the Islamic State, which is thousands of miles away, the Mexican Drug War is being fought on both Mexican and American soil. This war in my view is more immediate and affecting both the American and Mexican peoples. It is destroying lives on both sides of the border, and it seems that the U.S. government and much of the U.S. media have little interest in dealing with this war. It seems that the U.S. government does not really want to help the Mexican people, nor even acknowledge that this is a real war. Meanwhile, the families of these poor unfortunate students are asking what happened to their loved and and how many more people will die in the ongoing Mexican Drug War.